The painting is an riginal pastel, 11.5″ x 8″, on Fabriano Pastello Tiziano paper, in the dark green hue. I offer full-size giclee prints as well as digital and canvas prints. From the window at the back of my house I can see out over the valley and the hill beyond. When it snows at night the scene is transformed from black velvet punctuated by rooftops and streetlights and lit windows to a hazy wonderland of blue and creamy white, the familiar rooftops and trees given depth and dimension by the falling snow. 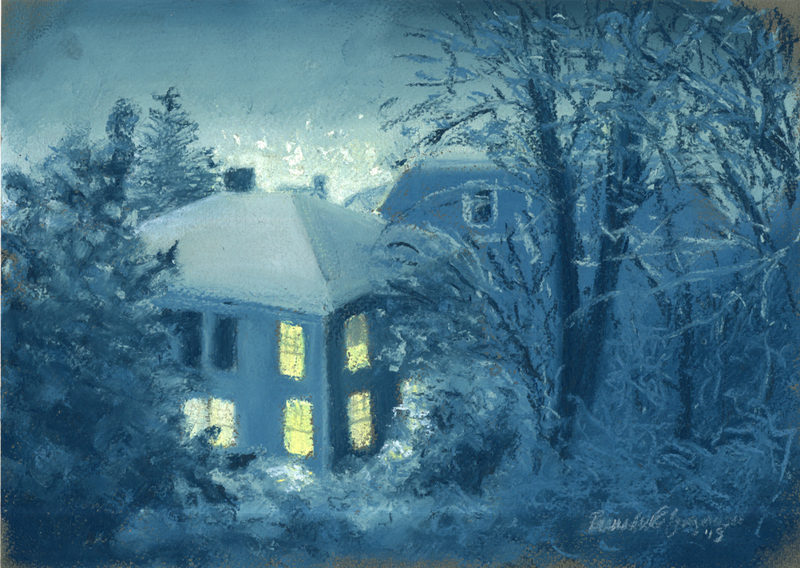 Just like “Frosty Morning, Just Before Sunrise”, I’d been visualizing this little painting of the snow falling at night, the house with lit windows nestled into the snow-dusted branches and bramble and trees, silhouettes of rooftops beyond, the lights of Carnegie’s Main Street brightening the view behind them, then the haze of snowfall where normally I’d see only darkness. It looks quaint and kind of cliché, but it looks like home to me. This painting is done in Sennelier pastels on Fabriano Pastello Tiziano paper, in the dark green hue. I knew that I could get the softness I wanted from the Sennelier pastels on this paper which has a nice soft surface to capture pastel, and though I wasn’t sure I wanted the texture of the laid finish it worked well to break up and soften the edges. I used three tones of Prussian blue which is a cool blue tending toward slate blue and tempered it with violet and gray in the shadows, then added pinks and yellows to the lighter areas. The windows, of course, are several shades of yellow. The frame is 1.5″ gray barnwood with a white wash, the top mat slate blue with black core, and the bottom mat pale yellow with white core. Mat size total is 2″, frame size is 16″ x 12″. Though the print is an odd size, it fits well enough into a 12″ x 16″ frame with a mat; see my framing option below. Digital prints are made on Epson Velvet fine art paper, acid-free matte-finish white 100# cotton rag archival digital inks. While digital prints are not the quality of a giclee in capturing every nuance and detail of color, texture and shading, I am still very pleased with the outcome and usually only I as the artist, could tell where detail and color were not as sharp as the original. In fact, I make the prints myself as ordered and ensure each one is as close to the original as my printer can get. The larger canvas print is twice the size of the original because that’s a standard size with the company which makes my canvas prints. The actual size canvas is actually a custom-order item and the print is made and stretched by the same small local company as my giclee prints. Because I have limited space, I order canvases as they are ordered. The larger canvas is 1-1/2″ in depth, the smaller is 3/4″, and I set them up so the image runs from edge to edge; on these canvases the sides are black. Find this painting in my Etsy shop. This entry was posted in landscapes, pastel, prints of artwork and tagged digital prints, framed art, giclee prints of pastel painting, landscapes, pastel painting, snow, winter, winter landscape on January 27, 2015 by Bernadette.